WHY VISIT? 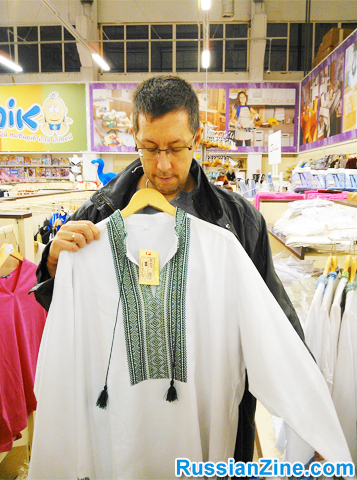 : Western Ukraine is where the heart of the Ukrainian people can be found. From the castles of Lutsk to the gorgeous, European-style architecture of Lvov, Western Ukraine is a growing tourist destination. HOW TO GET THERE: Fly to Kiev, take a cab to the train station, and from there buy a ticket on one of the minivans that leave on the hour or so to either Lvov (or “Lviv” in Ukrainian) or to Lutsk. WHERE TO STAY: Probably best to make Lvov your home base and plan to take a short day trip to Lutsk. As always, just use Google to find “rental apartments in Lvov Ukraine.” However, if you have $200/night to spend on lodging, my unhesitating recommendation would be the Leopolis Hotel on16 Teatralna Street. We splurged one night and were sad to leave the next day. The Leopolis is in the perfect location, right in the center of Old Town, and is a beautiful boutique hotel with friendly, smiling staff. The Black Cat (in Ukrainian: Чорний Кот) ostensibly considered a “pub” is a much classier place than that. The décor, with quality paintings on the wall, is loftier than any pub I’ve been to. And the cuisine is broadly European. French soup and cheeses, Turkish kebab, Austrian strudels and cakes, and so on. Everything I’ve ever sampled there has been delicious. As with so many Ukrainian restaurants, the Black Cat still struggles to attain European style service. That is to say, they’re often slow on the busy nights. My other favorite (and more wallet-friendly) place is…Puzata Hata (Roughly translated: Big Belly Hut) Here’s a photo of my most recent meal there. Everything I ate was delicious. Starting at the top I had: Aa (small) tomato and cucumber salad. 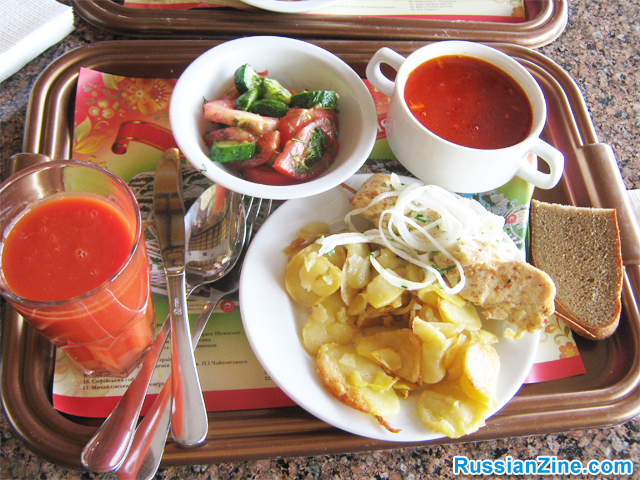 A serving of their borscht. Fresh carrot juice. (They’re much more into juicing in Ukraine than in the U.S. Almost any cafe will offer fresh squeezed juices.) For my main meal that’s a chicken shish-kebab and “village” potatoes. And the ubiquitous piece of dark bread. 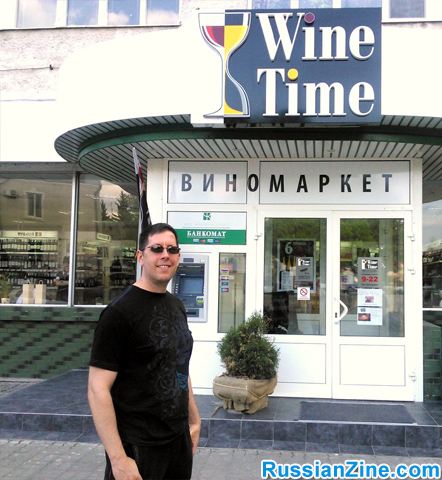 Meanwhile, in Lutsk, take your pick from any of the cafes on the main walking street, or – if you’re on a budget – try the self-serve “Vareniki” on the top floor of the “Lutsk” shopping center at the head of the walking street. HOW TO GET AROUND: Stay in the center and walk as much as you can. Neither city is so big that you’ll need a taxi much. WHAT TO SEE & DO: In Lutsk, the list begins and ends with their castle in the old town. 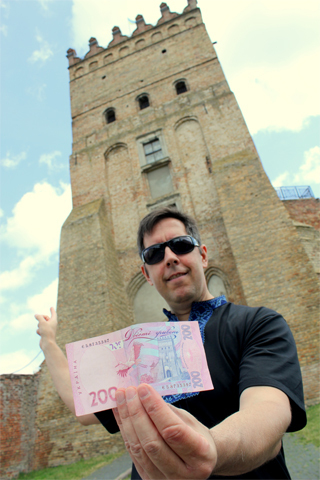 The castle is considered one of the “Seven Wonders of Ukraine” and is featured on their 200 grivna bill. In Lvov, it’s best to go without much of a plan. Just start in the city center, in the Old Town and wander wherever your eyes take you. 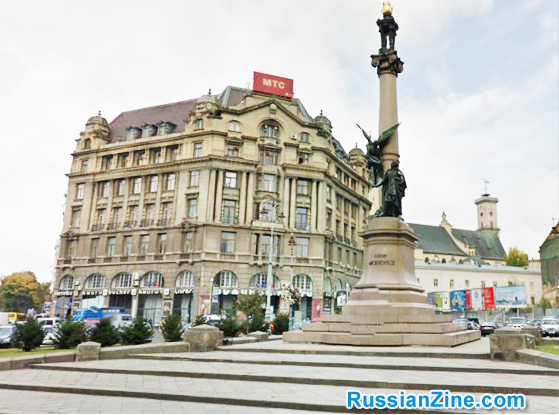 Lvov is such a beautiful city, the most European of any city in Ukraine or Russia, and it has something for everyone: Good shopping, good food, tons of history, a nice museum, a world class opera/theater, churches, nightlife, and so on. 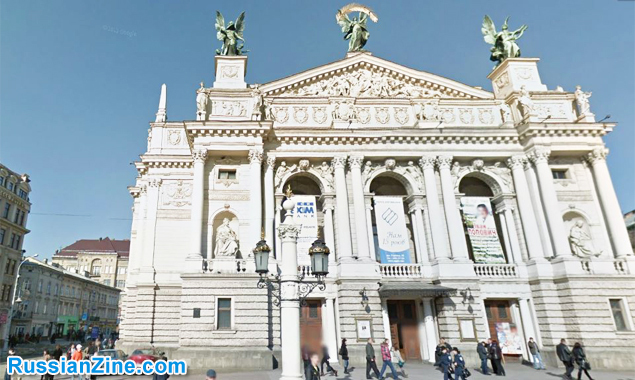 One must see, at least from the outside, is Lvov’s opera house. OFF THE BEATEN PATH: My favorite non-historical, non-cultural, place to go in Lvov is their Aqua-park. Check out the photos at their website: http://www.aqualviv.com.ua/pro-nas This place is a great time with friends, or of course if you have kids.